Where and how can I find the striker perfectly suited to my team? There is no panacea out there, but a couple of intriguing approaches. Let us just put any subjectivity aside and solely concentrate on statistical inquiries. Particularly, when clubs are looking for a new player they often rely on old-fashioned methods. Thus, only players already known to the club or players, who are dependent on discretion of talent scouts, come to the fore. Most importantly, we need the reference points for the following experiment. Because what does that do for us, when we use arbitrarily determined numbers a player has to show to fall into our clutches? Historical reference value can help. The test object is Borussia Dortmund. Our starting situation: With the arrival of Thomas Tuchel, the lately struggling Borussia Dortmund want to make changes regarding their roster. Which system Tuchel will prefer in the upcoming season – maybe the 4-3-1-2 we know from his Mainz days – remains cloudy until the start of the campaign. Moreover, the 41-year-old is known for his consistent formation changes and for his flexibility to react to the opposing system – sometimes with mirrorings of formations. Therefore, BVB need adaptable players like Gonzalo Castro who has already been signed. The yet speculated options for the forward line prompt questions, though. Last season, Borussia Dortmund played a 4-2-3-1 with a lone striker, while two more forwards being on the bench. Pierre-Emerick Aubameyang deservedly carved out his spot as preferred no. 9, albeit he still has issues with certain environments up front, especially in narrow central zones. The alternatives have been Ciro Immobile and Adrián Ramos. Speculations are spreading that at least either of them could leave Borussia Dortmund during the summer transfer window. Immobile could return to Italy. Ramos could be looking for another club in the Bundesliga, although Tuchel was very interested in signing the Colombian international when being in charge at Mainz. Let assume that BVB are after a new striker as alternative to Aubameyang or as the second forward in a system with two players up front. The following has been spread so far: Dortmund’s former coach Jürgen Klopp eyed Max Kruse up who has not been highly regarded by Tuchel. In the meantime, Kruse has signed for Wolfsburg. Furthermore, some sources circulated the rumour Dortmund would be interested in signing Kevin Volland who can also play as a striker – rather in a system with two forwards. However, the 22-year-old has recently extended his contract at Hoffenheim. The alleged interested in the 19-year-old Obbi Oularé seems to be surprising, because for the main part the Club Brugge striker is a wall player, displaying significant weaknesses in terms of ball handling. At this point, we do not want to assess players on the basis of subjective impressions, but based on statistical values in the classical sense. Aubameyang does not serve as a reference point, but Robert Lewandowski and his numbers in his last Dortmund years combined with his portion of the overall performance can function as reference. Lewandowski has epitomised the necessary versatility, because he act variably while slipping into different roles as lone striker. Plus, he is just great in every aspect of the striker game. Of course, BVB cannot simply sign some doppelganger coming out of one of the top leagues. A player like Lewandowski was unaffordable last summer, and the same goes for this summer. Consequently, we should focus on rather unknown players who could have the potential of Lewandowski. 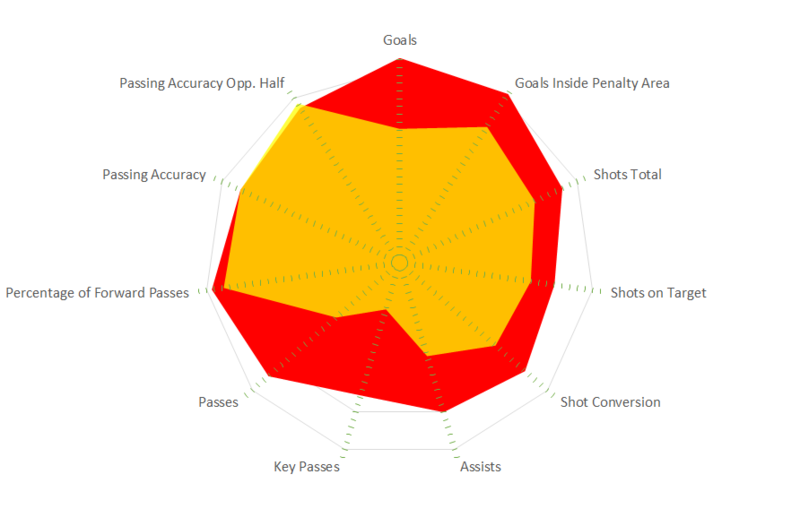 Evaluating Lewandowski’s numbers including his portion of the overall performance, focusing on shots, particularly inside the penalty area, and forward passes. Looking globally for similar or better results, although a player à la Messi will be removed manually. If the individual numbers are in conformity with the reference values, then we compare these players with Lewandowski’s percentage of the team performance. Confronting the remaining strikers with league numbers and various ratings, therewith the strength of the respective leagues shall have influence on the observation. The Pole played almost every Bundesliga game throughout the seasons 2012-13 and 2013-14 so that we can use the 90 min metrics without hesitation. Afterwards, we calculate Lewandowski’s percentage of goals, shots, created chances, and passes during the last two seasons at Signal Iduna Park. 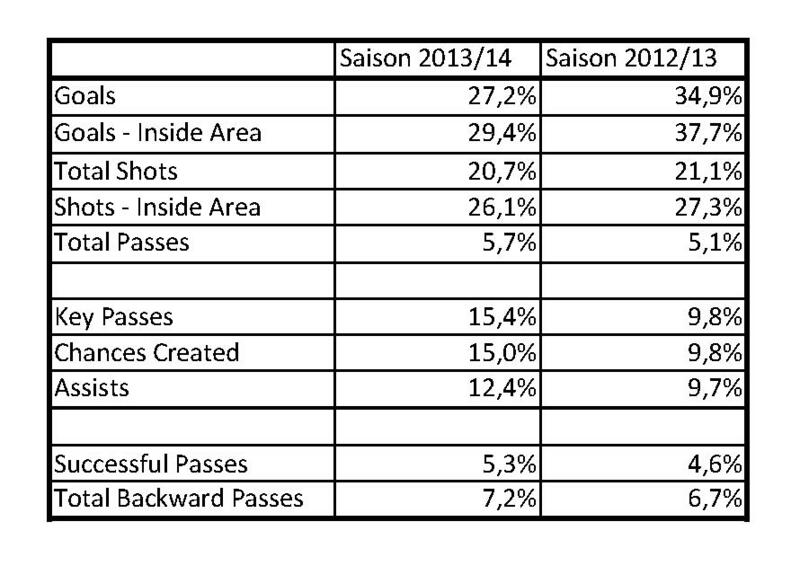 By the way, the striker was more involved in creating goal scoring opportunities in 2013-14. At least 25 passes per match, with a passing accuracy of 72 percent at the minimum. At least 56 percent of the passes have to be played forward. At least 1.0 key passes per match. At least 3.2 shots per match, with 2.2 shots on target. At least 17 percent of all shots have to be converted. At least 10 percent of the possible match time have to be played. After that, 16 players, who fit in an appropriate age and position pattern, with some under-19 players being selected, are filtered out. Three players should be removed: Lionel Messi, Cristiano Ronaldo, and Memphis Depay. Because of percentages of the average team performance we have to remove a couple of players, as they undercut the Lewandowski numbers. Due to this selection Soriano, Zahavi, and Brett remain in the over-21 section; Palmer, Brašnić, and Eggestein in the under-21 section. Since we can assess the leagues above the juniors level more concretely, a separation seems useful. Finally, we compare Soriano, Zahavi, and Brett, and for that reason some ratings and key figures in terms of shots, shot conversion, involvement in creating chances etc. are applied. Plus, factors like weighting certain striker qualities and respective associations’ club coefficients are entered into the equation. However, it has to be mentioned that the last step is optional. At the end, we have a fairly clear result, precisely because Zahavi is rather a midfield player. Soriano shines out, and, despite his age, he has all the attributes to act flexibly in various systems. The Spaniard, who had been under contract to Espanyol and FC Barcelona, can be well considered a late-comer, as he is already 29 years old. He made his breakthrough under Roger Schmidt at Red Bull Salzburg what is made clear by his Goalimpact chart. Among the Under-19 prospects, Johannes Eggestein comes out on top. The Werder Bremen player recently showed his talent at the UEFA European Under-17 Championship in Bulgaria. However, we should take into consideration that Leverkusen’s Marc Brašnić is also a promising candidate. Leverkusen has not extended his contract until 2018 for no reason. And some English clubs have advertised an interest in his services. He will spend the next season on loan at second tier side Paderborn. Both Eggestein and Brašnić could have what it takes to grow into the required profile. The bottom line is that: Surely, the certain formulas and valuation standard should be consistently improved, while this is a never-ending process. Moreover, there are certainly debates about which numbers influence the player’s performance at the certain position the most. And it should be added that certain system issues as well as individual and group tactical orders, which can vary from match to match, have hardly any influence on the search. Last but not least, the collection of certain data – particularly data of events like dribbles and tackles – can be questioned. Nevertheless, worldwide selections almost entirely based on data can have an enormous impact at a higher professional level. Clubs are not restricted to their own tiny cosmos or they rely on scouts, despite clubs cannot deploy them across the whole world.